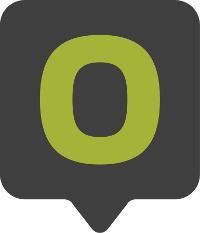 In German folklore the first words of Heinrich Heine’s poem “Lied von der Loreley” (engl. : “Song about the Lorelei”) are widely known well beyond the Rhine Gorge. The steep slate rock at St. Goarshausen is part of the UNESCO world heritage “Upper Middle Rhine Valley“ and has been a tourist attraction for many decades. Many myths and stories are connected with the rock that provides a spectacular view over narrow. The Rhine was a vital trade route during Roman times. Ever since then, the narrow at St. Goarshausen, which is located beneath the Lorelei, has caused many problems for sailors. Of the Rhine’s navigable passages this one is not only the deepest, but also the narrowest. The whirling currents make maneuvering ships extremely difficult. The slate rock that towers over this intricate spot has been a place of fascination for a long time. Dwarfs, nymphs and mountain trolls were used as explanations for the forceful currents. According to the tales, the dwarfs that lived in the rock caves were also responsible for the loud echoes of the Galgenbach waterfall and the murmuring sound of the Rhine. The Loreley mermaid as a statue at the Loreley harbor. A present from artist Natasha Alexandrowna Princess Jusoppow 1983 to the city of Goarshausen. The myths about the Lorelei only began including a female figure after the work of Clemens Brentano was published in the early 19th century. In his novel “Godwi oder das steinerne Bild der Mutter” he wrote a ballad about a sorceress whose beauty captivated all men. However, the sorceress fell from the rock into her death after thinking she saw her love on a ship. The most popular version of the myth derives from the German poet Heinrich Heine. There are numerous song versions of his poem from 1824. “Die Loreley” tells the story of an eponymous female whose song distracts the sailors from paying attention to the narrow Rhine passage, causing them to crash on the rocks. 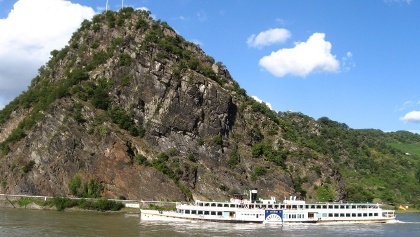 The myth about the Loreley was well received due its similarities to Greek mythologies such as the Sirens or Echo. In the middle of the 19th century the story way stylized as an ancient myth. By now, many people have forgotten that for many centuries the name simply referred to the slate rock. Nonetheless, today the supposedly ancient myth is used to market the region: Hotels as well as restaurants are named after the Loreley, souvenirs of a female figure are a sales hit and even a statue at the St. Goarshausen harbor takes up the female motif. There even is a Loreley representative. But unlike the myth figure, she does not bring misfortune. 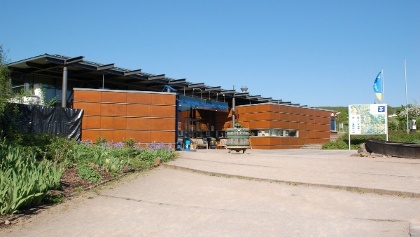 The visitor center at the rock plateau gives more insight into the Loreley mythology, but also presents information about the region’s history and culture. 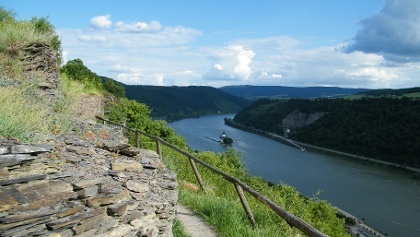 Different beautiful tours lead up to the rock plateau and the sight of the Rhine from the viewpoint is simply stunning. 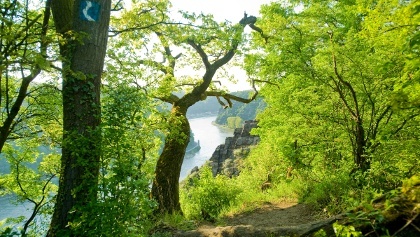 The term “Loreley” – whether it refers to the mythological female figure or the actual rock – is a household name!